Posted in Healthy Home & Garden on February 24, 2013. Last modified on January 31, 2018. Read disclaimer. Radon - you can't hear it, you can't smell it and you can't taste it -- but it is everywhere in the air. Unfortunately, as many as 7.1 million American homes contain dangerously high levels of radon resulting in an estimated 21,000 deaths per year. This makes radon the second leading cause of lung cancer, behind smoking (and the leading cause of lung cancer among non-smokers.) And for people who smoke, being exposed to elevated radon levels is especially problematic. The following radon mini quiz can help you learn more about radon and determine if it's something you should be concerned about. 1. Most commonly, radon enters buildings through open windows. In fact, indoor radon levels quickly drop with improved ventilation, such as opening windows. Because of this, wintertime levels are often higher. Radon is a radioactive gas that rises up through the soil from naturally occurring uranium and other metals in soil, rock and water. It can penetrate through cement slabs of buildings as well as through cracks and holes in a building's foundation. So, if present,	it tends to be at its highest concentration in the lowest levels of a home, such as a basement, and is generally 25 to 50% less as you go from one floor to the other. Generally, if you live on the third-floor of a building, radon is not a concern. While radon can be present in ground water well or public supply, drinking it is usually less of a health risk. The main concern from waterborne radon comes from breathing it in when showering, etc. 2. Are newer homes less at risk than older homes? The age of construction makes no difference. Everything else being equal, a leaky, less well insulated older home would contain less radon than a newer, energy efficient home. Houses with ventilated crawl spaces have less likelihood of having elevated radon, but even then, they often report high levels of radon. The only kind of house that does not need testing is a house that is fully up on stilts, off the ground. 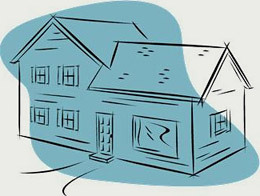 Fortunately, new construction can often prevent radon problems (at a much lower cost than one would incur later) if the builder follows radon-resistant techniques. 3. How do I know if our home, school or workplace is at risk of having elevated radon levels? While the United States Environmental Protection Agency has created a Map of Radon Zones that classifies every county in America as a Zone 1 (highest risk), 2 or 3 -- they caution that the map is to be used as a tool only for organizations to better channel resources. The EPA points out that homes with elevated levels are found in all three zones so, all homes should be tested regardless of where they're located. In fact, radon levels can vary greatly amongst homes on the same block. Even more remarkably, duplexes have been tested in which one side of the building was much higher in radon than the other half! Concerned about radon levels in schools? The EPA has developed a guide specifically for managing radon in schools. 4. How does one go about testing their home for radon? Available for self-testing over either a 3-4 day period (short term test kit, suitable for initial testing and as a follow-up if initial test returned highly elevated levels) or 3-12 months (long term test kit, often used if initial short term test returned moderately elevated radon level), most do-it-yourself, mail-in radon test kits are easy to use, inexpensive (usually $15-$25) and very reliable when directions are followed. In fact, some counties provide such testing kits for free during certain times of the year. If you prefer to leave the testing to the professionals, or if you are buying or selling a home and need instant results, some states provide lists of qualified contractors. 5. What happens if our house, school or workplace is found to contain elevated radon levels? Radon mitigation (reduction) systems are up to 99% effective at reducing radon levels to low-risk levels (no level of radon is considered to be safe). Though radon blocking sealants exist, the most widely accepted method involves repairing any cracks and holes in a home's foundation and then piping air from beneath the house to the outside with the use of a fan. Since radon mitigation requires specialized knowledge of the various treatments available, use only qualified radon contractor when addressing elevated radon problems. Be sure to retest your home after remediation has been performed and again every 2 years to make sure the system is working properly. Summary: Long-term exposure to radon increases one's risk of developing lung cancer. Two important factors are 1) the level of radon someone was exposed to and 2) the length of exposure -- because even relatively low levels can increase a person's risk over time. The US Environmental Protection Agency strongly recommends that EVERYONE test the lowest, occupied level of their home. Fortunately, do-it-yourself radon tests are extremely simple, affordable and reliable. If you learn that your home has elevated levels of radon, reduction methods are relatively affordable and highly effective.